King of the barnyard, Chanticleer struts about all day. 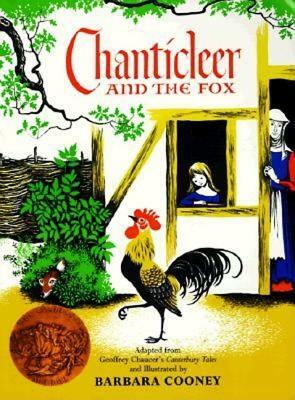 When a fox bursts into his domain, dupes him into crowing, and then grabs him in a viselike grip, Chanticleer must do some quick thinking to save himself and his barnyard kingdom. Often referred to as the father of English poetry, Geoffrey Chaucer was a fourteenth-century philosopher, alchemist, astrologer, bureaucrat, diplomat, and author of many significant poems. Chaucer’s writing was influential in English literary tradition, as it introduced new rhyming schemes and helped develop the vernacular tradition—the use of everyday English—rather than the literary French and Latin, which were common in written works of the time. Chaucer’s best-known—and most imitated—works include The Canterbury Tales, Troilus and Criseyde, The Book of the Duchess, and The House of Fame. Barbara Cooney is one of the most well-loved authors and illustrators of children's books today. She has won many awards for her books, including the American Book Award and two Caldecott Medals for Illustration. Ms. Cooney lives in Damariscotta, Maine.